Not that I need to keep you in suspense, but if I tell you what we're doing and then I blog about it Monday, it's a bit redundant, no? So I am going to do one of those bullet point bloggy things because some things aren't worthy of a full post. Tried another restaurant on Alison Cook's Top 100 - Pico's Mex Mex. I wasn't a huge fan. The dish was good at first, but then felt a little one-note and I was ready to be done eating it. Pork, pickled onions, black beans, and rice. I'm not sure why it was ranked #21. Holy inspiration, y'all. So many great bloggers this week talking about blog friendships, comparisons, social media, and great topics that make you think. Clearly I need to start reading some more so I can ruminate on my thoughts on some bigger topics. I find myself jokingly telling myself to do things so I can blog it. I should go to the gym... so I can blog it! I should take a picture of that... so I can blog it! I want to remember this conversation... so I can blog it! Now, I haven't blogged many of these things, but I do like that the thought of blogging is making me workout and document life more. Afterall, that is the point here - to remember how I lived at this point in my life. I am sorry for being a blog lurker for so long! I am so glad people are visiting me here but I wish a few more had something to say. I did that for years, so I completely understand it, and now I feel guilty! Latte art never gets old. I have lots to do before I can leave work and have fun on this weekend of mine. 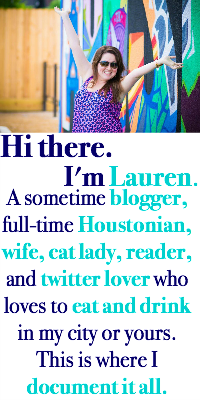 I will be tweeting (Lauren1031) and Instagramming (Laurenm10) for sure, so follow along, will ya? Have a great weekend! I want to go somewhere where they do latte art... so I can blog about it! I was a blog lurker for years too. Years and years and it still kind of makes me sad how much I missed out on by not jumping right in!